The people of Northampton want to know what has happened to their missing millions. The borough council loaned £10.25m to Northampton Town Football Club to redevelop the stadium and nearby land, but the funds have seemingly vanished, leaving an unfinished stand and the football club almost going under. This story began four years ago when a decision was made to invest in the new stand. Now a police inquiry is under way into "allegations of theft and fraud, bribery, misconduct in public office and electoral offences". In September 2017 it was announced seven people have been arrested and a further nine questioned under caution. In December the BBC revealed a further seven people had been questioned under caution, with money laundering added to the list of suspected offences. Now police say case files have been prepared in relation to 30 suspects. A two year BBC investigation has traced where most of the loan money seems to have gone, uncovering allegations millions of pounds was misappropriated by the developer appointed to oversee the project. We've also discovered how some of it may have financed other schemes and how the developer, Howard Grossman, disguised his funding of former council leader David Mackintosh's successful bid to become the Conservative MP for Northampton South. So far the BBC has discovered £37k in secret payments in to Mr Mackintosh's electoral fund from the company into which the bulk of the missing money disappeared. These hidden donations are now the part of the police inquiry, after the Electoral Commission referred our findings to them. Northampton Borough Council says it has no record of its former leader passing on a whistleblower's warning about the firm into which most of the loan money disappeared. David Mackintosh says this is "incorrect". That firm, 1st Land Ltd, also received VAT repayments totalling almost a million pounds. Mr Grossman says the payments were 'entirely legitimate'. Mr Mackintosh was also provided with free legal assistance by 1st Land's lawyer just months after money from the firm was channelled into his election campaign fund. We established how 1st Land's funds were used to pay for tickets and hospitality for a Premier League football club. The BBC also revealed how a senior council officer who would have blocked a loan wasn't told about the plans. The go-ahead to lend the money was given just weeks after she left. Mr Mackintosh, who stood down as an MP ahead of the 2017 General Election, said he welcomed both police investigations and that he "will co-operate fully". In March 2018, the BBC disclosed that Mr Mackintosh had been interviewed by police while under caution. Efforts to recover the missing £10.25m have cost Northampton Borough Council more than a million pounds so far. Below is our coverage to date. This timeline will be updated as we report on developments. Property developer Howard Grossman has been banned from running companies for 10 years after failing to provide accounting records to explain more than £5m missing from a football club loan. Northampton Borough Council is "unlikely" to recover all of the £10.25m it loaned to Northampton Town FC, the authority's chief finance officer has said. The former Northampton Town owner has been described by a judge as "untrustworthy" after he was ordered to repay £2.1m to a council that loaned money for a stadium redevelopment. Police say case files on 30 suspects are being prepared in connection with the missing loan. More than 550 witnesses and suspects have so far been interviewed in connection with the loan to Northampton Town FC. Northampton Borough Council has been paying £20,000 a month in interest on the money it borrowed to enable the Cobblers to rebuild their stadium. A 10-day civil case brought by Northampton Borough Council against the former owners of Northampton Town Football Club concludes. The wife of a former Northampton Town chairman has denied she and her husband transferred their house into her name to defraud creditors, a court heard. A former Northampton Town Football Club chairman has been accused of dishonesty while negotiating a £10m loan. The money, borrowed from Northampton Borough Council, was intended to be used to rebuild Sixfields stadium. David Cardoza told the High Court that overstating the club's outgoings to the council to try to get better loan terms was "just business". A former Northampton Town Football Club owner was paid a large sum from a council loan intended to rebuild its stadium, the High Court has heard. The High Court's been told how Northampton Borough Council's former council finance chief accepted free Tottenham Hotspur football tickets from a man at the centre of a £10.25m loan scandal. Northampton Town's owners put the club up for sale after a dispute with the local council. Chairman Kelvin Thomas described Northampton Borough Council as "an immovable force" after plans for a new development at Sixfields stalled. The council said it would continue to work "privately" with the club. Northampton Borough Council has spent more than £1m trying to claw back the missing £10m loan, the BBC can reveal. Former Northampton South Conservative MP David Mackintosh has been interviewed by police investigating the disappearance of millions of pounds loaned to Northampton Town Football Club. Mr Mackintosh said: "I attended an interview on a voluntary basis to assist Northamptonshire Police with their general enquiries". Seven more people have been interviewed for offences including money laundering over the missing loan to Northampton Town FC. The police investigation into a £10.25m loan to the Cobblers by the borough council is now in its third year and has so far involved 23 people being questioned or arrested. A small amount of the missing £10.25m loan made by Northampton Borough Council to the town's football club has been repaid, following a court hearing. The loan was for the redevelopment of Northampton Town's ground. A Conservative MP's general election fund took hidden payments from a developer as a multimillion-pound loan he personally oversaw paid out. More than £37,000 was channelled to David Mackintosh's 2015 campaign from 1st Land Ltd, while he was leader of Northampton Borough Council. Most of a £10.25m loan he signed off to redevelop Northampton Town FC has vanished and police are investigating. Howard Grossman, of 1st Land Ltd, and Mr Mackintosh deny any wrong-doing. Northampton South's former Conservative MP used the lawyer of a company at the centre of a "missing millions" probe for free, the BBC has learned. David Mackintosh used 1st Land's solicitor after £30k of its funds were channelled to his election campaign. The firm is being investigated over the disappearance of millions of pounds loaned to Northampton Town Football Club. Mr Mackintosh says the solicitor issued a single letter on his behalf. Seven people have been arrested in connection with the missing £10.25m loan to Northampton Town Football Club. A statement from Northamptonshire Police said it was investigating "allegations of theft and fraud, bribery, misconduct in public office and electoral offences". Nine other people have also been interviewed under caution, police said. Two senior council officers have been questioned by police under caution as part of the investigation into the £10m loan to Northampton Town Football Club. Northampton Borough Council's bid to recoup the unpaid £10.25m football stadium loan has "not had any success"
The former agent of Conservative MP David Mackintosh says his decision to step down was the correct one "as there is a major police investigation going on"
David Mackintosh, Conservative MP for Northampton South, announces his decision not to stand for re-election. Conservative MP David Mackintosh faces a deselection fight over his role in a loan in which millions of pounds of public money appears to have vanished and questions over hidden campaign donations. The relationship between Tory MP David Mackintosh and his constituency members has collapsed over the loan to the football club, a senior party figure has said. Former Lib Dem borough councillor Brendan Glynane has said he and others who raised concerns about the loan from Northampton Borough Council to Northampton Town Football Club were "lied to" by the then leader David Mackintosh. A spokesman for David Mackintosh said: "Any actions David took in regards to the loan as leader were taken in good faith based on the expert advice and information supplied to him by officers of the council." The chief executive of Northampton Borough Council has apologised for mistakes made in arranging the deal to lend Northampton Town FC £10.25m. David Mackintosh "will have to "consider his position", his local party chairman has said after the Conservative MP was criticised over a £10.25m loan to redevelop a football stadium. The company under investigation over missing public money intended for a Northampton Town's stadium redevelopment received almost £1m in VAT repayments, the BBC has learned. Northampton Borough Council rushed to approve a £10m loan to Northampton Town football club due to "political and management" pressure, a report has found. A senior council officer who had concerns about Northampton Town's finances left her post just weeks before her authority decided to loan the club more than 10 million pounds. The BBC has learned Northampton Borough Council's former head of finance hadn't been told about the plans. A firm being investigated over "missing millions" meant to revamp Northampton Town's ground spent £36,000 on tickets and hospitality for a Premier League football club, the BBC can reveal. Hidden payments totalling £30,000 to a Tory MP's general election campaign are being investigated by the police. A further £500,000 has been earmarked by Northampton Borough Council in its bid to recover the £10.25m it loaned to Northampton Town Football Club. Northampton Borough Council says it has no record of its former leader - now a Conservative MP - passing on a whistleblower's warning. David Mackintosh says this is "incorrect". 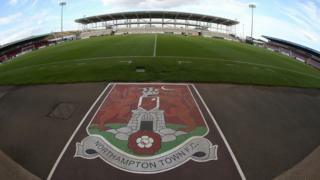 A council trying to recoup £10.25m it loaned to Northampton Town Football Club has said it could not locate the father of the club's former chairman, it wanted to serve legal papers on. Solicitors are to keep half the proceeds of any sale of David Cardoza's £1.2m family home in case of further legal action, a court has ruled. Northampton Borough Council is seeking an interim injunction to stop the sale of a house owned by the wife of the ex-chairman of the town's football club. A football stand at the centre of a financial row has reopened for the first time in two years. Thousands of pounds of taxpayers' money to fund a football stadium project may have been diverted to finance a string of other schemes. Millions of pounds of taxpayers' money intended for a football stadium redevelopment was "misappropriated" by developers. The ex-chairman of Northampton Town FC has been arrested by police investigating a £10.25m loan given to the club by the borough council. David Mackintosh MP has said a failure to declare an election campaign donation was down to an "error". A council leader said she will do everything in her power to retrieve millions of pounds of missing public money. A council has withdrawn insolvency proceedings against Northampton Town Football Club, claiming it is in everyone's "best interests" now a deal has been struck with a new owner. The future of Northampton Town has been secured after an agreement was signed to stop a hearing that could have seen the club go into administration. Undeclared payments made to an MP's office by a businessman will not be investigated by police. A council has said it has received a "number of offers" on land it claimed in return for an unpaid £10.25m loan for football stadium development. Northampton Town's players and staff have now all been paid their October and November wages after Kelvin Thomas' takeover of the League Two club. A Conservative MP's local party was given undeclared payments linked to a businessman involved in a stalled stadium development. Former Oxford United chairman Kelvin Thomas has completed his takeover of Northampton Town from David Cardoza. Northampton Town could be relieved of its £10.25m debt owed to the borough council, after the authority agreed to back a deal to sell the club. Police have started an investigation into "alleged financial irregularities" surrounding a council's £10.25m loan to Northampton Town Football Club. Northampton Borough Council has lodged a petition asking for Northampton Town to be put in administration in a bid to save the League Two club. The director of a company employed to oversee the development of a football stadium had failed in a previous business venture. A football club chairman and his father were given a "loan" of more than £2.5m by a company set up to oversee the development of its stadium. An MP says he "has to take some responsibility" over an unpaid £10.25m loan to a football club. Police are working with Northampton council "to see whether any criminality has occurred" in connection with its £10.25m loan to the town football club. Players and staff at Northampton Town Football Club have not been paid due to its financial problems, it has confirmed. A "sensible deal" to buy Northampton Town may not be possible, according to the man who wants to take control of the football club. Financial problems at Northampton Town Football Club mean there is "every chance" players and staff will not get paid on time. A council loan of more than £10m to a League Two football club will not be written off, the authority has said. A company set up to oversee the development of a new stand at Northampton Town Football Club has been forced into liquidation. League Two club Northampton Town have been issued with a winding-up petition by HM Revenue and Customs. Northampton Town Football Club has been given three weeks to pay back more than £10m to the borough council. Northampton Town fans are planning a peaceful protest before Saturday's League Two match against Oxford United over chairman David Cardoza's running of the club. League Two side Northampton Town are set to be taken over by an Indian consortium after both parties signed a heads of terms agreement. Work to redevelop one of the stands at Northampton Town's Sixfields Stadium has been temporarily halted by a "contractual dispute", the club said. Plans for a 100-room hotel, shops and houses next to a football stadium and athletics track in Northampton have been submitted to the borough council. A land deal including a £12m loan that forms part of a stadium development in Northampton is set to be backed. Northampton Town Football Club has agreed a deal with the local council that will see a multi-million pound redevelopment of its Sixfields Stadium. A deal that could see new shops, offices and a hotel built on land near Northampton Town Football Club's stadium has been given the go ahead.